LOUISVILLE, Ky. – Washington enters its ninth straight week at No. 1 in the USA Today/NFCA Division I Top 25 Coaches Poll. 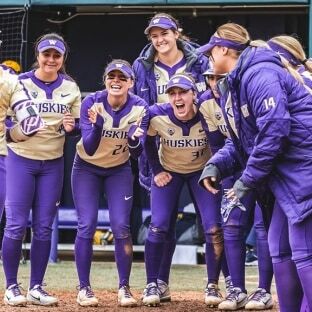 The Huskies (41-2) swept then-No. 25 California in a rain-shortened Pac-12 series and brought their winning streak to 12 games. For the second consecutive week they were one vote shy of being the unanimous No. 1 squad, collecting 31 of a possible 32 first-place votes and 799 points. Oklahoma received the other first-place vote and ran its winning streak to 29 games after posting a 5-0 week. The Sooners (38-2) cruised through Big 12 play with wins over Iowa State (9-1) and a sweep of Kansas (5-0, 15-4, 10-1). In its toughest contest of the week, OU rallied from a 6-0 deficit to edge Wichita State, 7-6. UCLA returned to No. 3 after a Pac-12 sweep of then-No. 12 Arizona (7-6, 7-3, 10-3) in Tucson, while Oregon fell a spot to No. 4 following a Pac-12 series win at then No. 7 Arizona State. The Ducks (34-7) took the first two contests (3-0, 9-1), but fell to the Sun Devils (34-7), 4-0, in the finale.
.@raaaccchhheeell was in beast mode all weekend! She hit home runs and went 2-0 in the circle with strike outs. Florida and Georgia traded spots at No. 5 and No. 6, respectively. The Gators (37-7) posted a 4-1 week with a victory over then-No. 15 Alabama, 3-2, and a three-game SEC sweep of then No. 11 South Carolina (3-1, 7-0, 3-0). UF did drop a mid-week contest at then-No. 13 Florida State, 4-1. The Bulldogs (37-6) defeated Georgia State, 7-0, and split a doubleheader against Mercer (2-5 in 8 inn., 7-5). No. 7 Tennessee moved up three positions following a 4-0 week, defeating Memphis, 8-0, and sweeping then-No. 14 LSU (4-2, 3-2, 6-4 in 8 inn.) in a tightly contest SEC series in Knoxville. Arizona State, Texas A&M and Florida State round out the top 10. The Sun Devils dropped two-of-three at home to Oregon, while the Aggies (36-10) collected an SEC series win over No. 20 Kentucky (9-2, 4-3, 2-3). The Seminoles (36-8) return to the top 10 for the first time since Week 2’s poll. FSU knocked off then-No. 6 Florida, 4-1, and took two-of-three from Boston College (0-1, 5-4, 5-0) on the road in ACC play. Oklahoma State makes its way back into the poll at No. 24. The Cowgirls (32-12) bounced back from a loss to UT Arlington by defeating Missouri State, 3-0, on the road and sweeping their Big 12 series from then-No. 16 Baylor (14-6, 2-1, 5-1). Hofstra makes its first appearance this season as the Pride (28-8) have won 10 straight and 18 of their last 19 contests. Sweep a top-16 ranked #Big12SB opponent. Notch a 4-1 record during Week 10. Then-No. 22 Ohio State and then-No. 25 California each dropped out of the poll for the first time since joining it in Week 1. The 2018 USA Today/NFCA Division I Top 25 Poll is voted on by 32 NCAA Division I head coaches, one representing each conference. Records reflect games played through April 15.